Mariano Rivera was born in Panama City, Panama, on November 29, 1969, to Mariano Rivera Palacios and Delia Jiron. The couple's second child, Rivera has one older sister, Delia, and two younger brothers, Alvaro and Giraldo. Supported by Mariano Sr.'s job as captain of a fishing boat, the family lived in Puerto Caimito, a Panamanian fishing village that Rivera described as "poor". As a young man, Rivera played soccer and baseball with his friends on the beach during low tide. Soccer was his favorite sport, and Pelé his favorite athlete. For baseball games, they substituted cardboard milk cartons for gloves and tree branches for bats, and they fashioned balls by taping wads of shredded fishing nets. Rivera used this makeshift equipment until his father bought him his first leather glove when he was 12 years old. Speaking about his youth, Rivera said that although he stayed out of trouble, he "was hanging with the wrong people". Rivera attended Escuela Victoriano Chacón for elementary school and La Escuela Secundaria Pedro Pablo Sanchez for his secondary education, but he dropped out in ninth grade. At age 16, he began to learn the fishing trade by working on a commercial boat captained by his father, catching sardines. Rivera, who worked six-day weeks, year round, called the job "extremely hard" and was more interested in becoming a mechanic. Two incidents on his father's boat further validated his doubts about fishing as a career. In 1988, Rivera's uncle Miguel was lashed by an unsecured rope that shot off a hydraulic mechanism, and a month later he died from his injuries. About a year later, at age 19, Rivera was forced to abandon his father's ship after it began capsizing due to a malfunctioning water pump and an overweight load of fish. After three years of learning the trade, Rivera quit. He continued to play sports during his teenage years but eventually quit soccer after a series of ankle and knee injuries around age 17. Consequently, he shifted his attention to baseball but considered it just a hobby rather than a potential profession. At age 18, Rivera joined the Panamá Oeste Vaqueros, a local amateur baseball team, as a utility player. Scout Herb Raybourn watched him play shortstop in a 1988 baseball tournament but did not project him to be a major leaguer. A year later, Panamá Oeste's pitcher performed so poorly in a playoff game that Rivera was asked to replace him, and despite no experience at the position, he pitched well. Teammates Claudino Hernández and Emilio Gáez consequently contacted Chico Heron, a scout for the New York Yankees. Two weeks after his pitching debut, Rivera was invited to a Yankees tryout camp run by Heron in Panama City. Raybourn, who had returned to Panama to scout as the Yankees' director of Latin American operations, received a tip about Rivera. Raybourn was surprised to hear he had switched positions but decided to watch him throw. Although Rivera had no formal pitching training, weighed just 155 pounds (70 kg), and threw only 85–87 miles per hour (137–140 kilometers per hour), Raybourn was impressed by his athleticism and smooth, effortless pitching motion. Viewing Rivera as a raw talent, Raybourn signed the amateur free agent to a contract with the Yankees organization on February 17, 1990; the contract included a signing bonus of US$2,500 ($4,794 today), according to Major League Baseball (MLB) records. After signing his contract, Rivera—who spoke no English and had never left home—flew to the United States and reported to the Gulf Coast League (GCL) Yankees, a Rookie level minor league affiliate of the New York Yankees. Feeling lonely and homesick, he wrote home to his parents often, as they did not have access to telephones in Puerto Caimito. At that point in his career, scouts considered Rivera to be a "fringe prospect" at best, but he made progress with a strong 1990 season for the GCL Yankees. Pitching mostly in relief, he allowed only 24 baserunners and one earned run in 52 innings pitched—a 0.17 earned run average (ERA). The team permitted Rivera to start the season's final game in order for him to accumulate enough innings pitched to qualify for the league's ERA title (which carried a $500 bonus); his subsequent seven-inning no-hitter "put him on the map with the organization", according to manager Glenn Sherlock. In the offseason, Rivera returned to Panama, where a tip from him to Raybourn led to the Yankees signing a promising local 16-year-old player, Rivera's cousin Rubén. In 1991, Mariano was promoted to the Class A level Greensboro Hornets of the South Atlantic League, where he started 15 of the 29 games in which he pitched. Despite a 4–9 win–loss record, he recorded a 2.75 ERA in ​114 2⁄3 innings pitched and struck out 123 batters while walking 36 batters. New York Yankees manager Buck Showalter took notice of Rivera's strong strikeout-to-walk ratio, calling it "impressive in any league" and saying, "This guy is going to make it." In 1992, Rivera was promoted to the Class A-Advanced level Fort Lauderdale Yankees of the Florida State League (FSL) but missed the first third of the season with elbow stiffness. He started ten games for Fort Lauderdale, compiling a 5–3 win–loss record and a 2.28 ERA, while walking only five batters in ​59 1⁄3 innings pitched. Ultimately, Rivera was sidelined again after suffering damage to the ulnar collateral ligament (UCL) in his right elbow. The injury was attributed to him snapping his wrist during his throwing motion in an attempt to improve the movement on his slider pitch. Rivera underwent surgery on August 27, 1992, to repair the damage, leading to concerns that he would be out through the 1993 season. Contrary to popular belief, the operation was not Tommy John surgery; Rivera's surgeon, Dr. Frank Jobe, determined that ligament replacement was not necessary and instead repaired the frayed UCL. Rivera's rehabilitation coincided with MLB's 1992 expansion draft to fill the rosters for two expansion teams, the Florida Marlins and Colorado Rockies. He was left unprotected by the Yankees but was not drafted. During Rivera's rehabilitation, he played catch with former Yankees pitchers Whitey Ford and Ron Guidry, and faced batting practice from his first minor-league pitching coach, former pitcher Hoyt Wilhelm. Once reactivated, Rivera returned to the Class A level Hornets for an abbreviated 1993 season in which he was kept on a limited pitch count. Hornets shortstop Derek Jeter, who would later be Rivera's teammate in the major leagues, kept track of his number of pitches during games. In ten starts, Rivera pitched ​39 1⁄3 innings and walked 15 batters, while recording a 2.06 ERA. Witnessing him recover, the Hornets' official scorer Ogi Overman was not optimistic about Rivera's future, saying, "I thought [he] was on a one-way trip to nowhere." In 1994, Rivera was promoted from the Class A-Advanced level Tampa Yankees of the FSL to the Double-A level Albany-Colonie Yankees of the Eastern League, and then to the Triple-A level Columbus Clippers of the International League. He finished the year with a 10–2 record in 22 starts, although he struggled for Columbus, recording a 5.81 ERA in six starts. At the start of the 1995 season, he was ranked the ninth-best prospect in the Yankees organization by sports magazine Baseball America; by contrast, the publication ranked Rivera's highly touted cousin Rubén as the second-best prospect in baseball. Mariano's pitching repertoire primarily consisted of fastballs at the time, although he threw a slider and changeup as secondary pitches. He began the 1995 season with Columbus, pitching to a 1–1 record and 1.50 ERA in four starts. Rivera (second from right) with his fellow Core Four teammates in 2015. All four made their major league debut for the Yankees in 1995. After being called up to the major leagues on May 16, 1995, Rivera made his debut for the New York Yankees on May 23 against the California Angels. Starting in place of injured pitcher Jimmy Key, Rivera allowed five earned runs in ​3 1⁄3 innings pitched in a 10–0 loss. He struggled through his first four major league starts, posting a 10.20 ERA, and as a result, he was demoted to Columbus on June 11. As a 25-year-old rookie just three years removed from major arm surgery, Rivera did not have a guaranteed spot in the Yankee organization. Management considered trading him to the Detroit Tigers for starter David Wells. While recovering from a sore shoulder in the minor leagues, Rivera pitched a no-hit shutout in a rain-shortened five-inning start. Reports from the game indicated that his pitches had reached 95–96 mph (153–154 km/h), about 6 mph (9.7 km/h) faster than his previous average velocity; Rivera attributes his inexplicable improvement to God. Yankees general manager Gene Michael was skeptical of the reports until verifying that Columbus' radar gun was not faulty and that another team's scout had taken the same measurements. Afterwards, he ended any trade negotiations involving Rivera. On July 4, in his first start back in the major leagues, Rivera pitched eight scoreless innings against the Chicago White Sox, allowing just two hits while striking out 11 batters. In five subsequent starts, he was unable to match his success from that game. After a brief demotion to Columbus in August, Rivera made one last start in the major leagues in September before he was moved to the Yankees' bullpen. Overall, he finished his first major league season with a 5–3 record and a 5.51 ERA in ten starts and nine relief outings. His performance in the 1995 American League Division Series, in which he pitched ​5 1⁄3 scoreless innings of relief, convinced Yankees management to keep him and convert him to a relief pitcher the following season. "He needs to pitch in a higher league, if there is one. Ban him from baseball. He should be illegal." In 1996, Rivera served primarily as a setup pitcher, typically pitching in the seventh and eighth innings of games before closer John Wetteland pitched in the ninth. Their effectiveness as a tandem helped the Yankees win 70 of 73 games that season when leading after six innings. Over a stretch of games between April 19 and May 21, Rivera pitched 26 consecutive scoreless innings, including 15 consecutive hitless innings. During the streak, he recorded his first career save in a May 17 game against the Angels. Rivera finished the regular season with a 2.09 ERA in ​107 2⁄3 innings pitched and set a Yankees single-season record for strikeouts by a reliever (130). Baseball-Reference.com calculated his value to the Yankees that year to be 5.0 wins above replacement (WAR), a figure no reliever has surpassed in a single season since. In the postseason, he allowed just one earned run in ​14 1⁄3 innings pitched, helping the Yankees advance to and win the 1996 World Series against the Atlanta Braves. It was the franchise's first World Series championship since 1978. In MLB's annual awards voting by the BBWAA, Rivera finished in twelfth place for the American League (AL) Most Valuable Player (MVP) Award and third for the AL Cy Young Award, which is given to the league's best pitcher. Commentator and former player Tim McCarver wrote that the Yankees "revolutionized baseball" that year with Rivera, "a middle reliever who should have been on the All-Star team and who was a legitimate MVP candidate." Yankees management chose not to re-sign Wetteland in the offseason, opting instead to replace him with Rivera as the team's closer. In April 1997, MLB retired the uniform number 42 league-wide to honor Jackie Robinson for breaking the baseball color line, although Rivera was among a dozen players allowed to continue wearing the number per a grandfather clause. Rivera's transition from setup man to closer in 1997 was not seamless; he blew three of his first six save opportunities and indicated that he was initially uncomfortable in the role. With reassurance from manager Joe Torre, Rivera settled into the ninth-inning role, and he earned his first All-Star selection with 27 saves and a 1.96 ERA at the midseason break. In the 1997 All-Star Game, he pitched a perfect ninth inning to collect his first save in an All-Star Game. That summer, he added a cut fastball to his pitching repertoire after accidentally discovering how to throw the pitch. Rivera finished the regular season with 43 saves in 52 opportunities and a 1.88 ERA. His first year as closer ended with a blown save in Game 4 of the 1997 AL Division Series against the Cleveland Indians; with the Yankees four outs from advancing to the next round of the postseason, Rivera allowed a game-tying home run to Sandy Alomar Jr. The Yankees eventually lost that game and the next, eliminating them from the postseason. After spending two weeks on the disabled list with a groin strain during the opening month of the 1998 season, Rivera continued to establish himself as one of the major leagues' best closers. Moreover, he became the central figure of a Yankees bullpen that, supported by middle relievers Jeff Nelson and Mike Stanton, contributed to the team's late-1990s dynasty. That year, Rivera made the cutter one of his primary pitches, and it quickly became his signature, earning a reputation for breaking hitters' bats with its sharp lateral movement. He saved 36 games in 41 opportunities and had a 1.91 ERA in the regular season. In the 1998 postseason, he pitched ​13 1⁄3 scoreless innings and saved six games, three of which came in the 1998 World Series against the San Diego Padres. Rivera's save in Game 4 of the series clinched the Yankees' championship, capping off a season in which they won an MLB-record 125 games combined in the regular season and the postseason. By season's end, Rivera had allowed only two earned runs in 35 career postseason innings pitched—a 0.51 ERA—and by passing 30 innings pitched, he qualified for the major league record for lowest postseason career ERA; it is a record he still holds after 141 innings pitched. In 1999, Rivera was selected for the All-Star team for a second time with 23 saves and a 2.29 ERA in the first half of the season. That summer, the Yankee Stadium scoreboard production staff began playing the song "Enter Sandman" by heavy metal band Metallica as Rivera's entrance music. Staff members selected the song after witnessing in the previous year's World Series how enthusiastically San Diego fans reacted to closer Trevor Hoffman entering games accompanied by AC/DC's "Hells Bells". Although Rivera was indifferent about his entrance music, "Enter Sandman" soon became as much a part of his identity as a closer as his cutter. After recording three blown saves and a 7.84 ERA in July, he allowed just one earned run over his last 30 appearances. He ended the season with a 1.83 ERA and 45 saves in 49 opportunities, his first time leading the major leagues in saves. He received his first AL Rolaids Relief Man Award, an annual award for the league's best closer based on their statistics. In the 1999 World Series against the Braves, Rivera recorded a win and two saves, the second of which clinched the Yankees' championship title, his third overall. For his performance against Atlanta, he received the World Series MVP Award. Rivera finished 1999 by pitching 43 consecutive scoreless innings in the regular season and postseason combined, and he placed third in voting for the AL Cy Young Award. After the season, he revealed tentative plans to retire and become a minister after playing four more seasons, though he backed off these plans the following year. In the offseason, Rivera lost his salary arbitration case, in which he requested an annual salary of $9.25 million, but arbitrators awarded him $7.25 million per year, which was at the time the highest arbitration award in baseball history. In the 2000 season, Rivera was selected as an All-Star for the third time. On July 8, he saved two games, each played in a different ballpark, as part of a day-night doubleheader against the New York Mets at Shea Stadium and Yankee Stadium. He ended the season with 36 saves in 41 opportunities and a 2.85 ERA. In the postseason, Rivera saved six games, allowed three earned runs in ​15 2⁄3 innings pitched, and broke two major league records: he eclipsed Dennis Eckersley's record for postseason saves with the 16th of his career; he also broke Whitey Ford's record for consecutive scoreless innings pitched in postseason play, a streak that ended shortly thereafter at ​33 1⁄3 innings. In the 2000 World Series against the Mets, Rivera clinched a championship for his team for the third consecutive year. It was his fourth World Series title overall. By this point, he had established a reputation as an exceptional postseason performer—journalist Jack Curry called him the "infallible weapon" and "the greatest reason the Yankees [were] three-time champions". With Rivera's contract set to expire after 2001, the Yankees signed him to a four-year, $39.99 million deal prior to the season, marking the first long-term contract of his career. In 2001, he was selected for the All-Star team for a third consecutive year. His final numbers included a 2.34 ERA, a closer career-high ​80 2⁄3 innings pitched, and an MLB-leading 50 saves in 57 opportunities—his second time leading the league. His saves total that year surpassed Dave Righetti's 46 saves in 1986 for the most by a Yankee pitcher in a single season, and made him just the sixth MLB pitcher to reach 50 saves in a single season. Rivera's performance earned him his second AL Rolaids Relief Man Award. Despite having what sportswriters deemed an "aura of invincibility" in the postseason, Rivera failed to close out the decisive Game 7 of the 2001 World Series against the Arizona Diamondbacks. In one of his most infamous moments, he blew a save in the bottom of the ninth inning, in part due to his own throwing error, and he lost the Series later in the inning by allowing Luis Gonzalez's bloop single with the bases loaded to score the winning run. It was the first and only loss of Rivera's postseason career, and it snapped his record streak of 23 consecutive postseason saves converted. On May 9, 2002, Rivera recorded his 225th career save, surpassing Dave Righetti as the Yankees' franchise leader in saves. Over the next few months of the season, injuries limited his playing time. He was first placed on the disabled list in June due to a groin strain, though his first-half numbers, which included a 1.47 ERA and 21 saves, earned him an All-Star selection. In a game on July 14, Rivera endured one of his worst outings, allowing six earned runs, including a walk-off grand slam. One week later, he was placed on the disabled list with a shoulder strain. Rivera was activated on August 8 after receiving a cortisone shot but returned to the disabled list after a recurrence of shoulder tightness. For the season, Rivera recorded a 2.74 ERA and 28 saves in 32 opportunities in just 46 innings pitched. To placate the Yankees' concerns about his durability, Rivera followed a strength and conditioning program in the offseason, instead of throwing. Torre said that he would try to reduce Rivera's workload during the 2003 season to minimize the injury risk to his closer. However, Rivera suffered a groin injury before the season began, causing him to miss the first month. After returning on April 30, he pitched well in the season's first half, saving 16 games in 17 opportunities. His save on June 12 against the St. Louis Cardinals secured the 300th career win for starter Roger Clemens. Rivera slumped early in the second half; over one stretch, he blew five of eleven save opportunities, but he rebounded to convert his final 15 of the season. He finished the 2003 regular season with a new career best in ERA (1.66), along with 40 saves in 46 opportunities. In the 2003 AL Championship Series against the arch-rival Boston Red Sox, Rivera had one of the most memorable postseason performances of his career; in the decisive Game 7, he entered in the ninth inning with the score tied 5–5 and pitched three scoreless innings, his longest outing since 1996. He became the winning pitcher after Aaron Boone hit an eleventh-inning walk-off home run that clinched the Yankees' series victory and advanced them to the 2003 World Series. Rivera celebrated by running to the pitcher's mound and collapsing in joy to thank God, as Boone rounded the bases and was met by his teammates at home plate. Rivera was named the AL Championship Series MVP for recording two saves and a win in the series. The Yankees lost the World Series to the Florida Marlins; Rivera saved five games and allowed only one earned run in 16 innings pitched that postseason. Prior to the 2004 season, with a year remaining on his contract, Rivera signed a two-year extension worth $21 million, with an option for a third year. That season, Rivera surpassed 300 career saves and made his sixth All-Star team with 32 saves at the midseason break, then an AL record. His final numbers for the year included a 1.94 ERA and a career-high 53 saves in 57 opportunities; it was his third time leading the major leagues in saves. Along with winning a third AL Rolaids Relief Man Award, he placed third in the AL Cy Young Award voting. Following the Yankees' victory in the 2004 AL Division Series against the Minnesota Twins, Rivera returned home to Panama to mourn two relatives who had died in an accident in his swimming pool. Despite his status being in doubt for the 2004 AL Championship Series against the Red Sox, he returned to New York for Game 1 after attending the funeral in Panama earlier in the day. He recorded a save that night, as well as in Game 2. Although the Yankees led three-games-to-none in the series, Rivera blew saves in Games 4 and 5, and the Red Sox won both games in extra innings to avoid elimination. In Game 4, Boston's Dave Roberts pinch ran and stole second base against Rivera, eventually scoring on a single to tie the game. In Game 5, Rivera entered with a one-run lead with runners on base and allowed a sacrifice fly to tie the score. Although he allowed just one earned run in the 2004 postseason, he blew three of five save opportunities in the two series. Boston's comeback victories helped them become the first team in MLB history to win a best-of-seven series in which they trailed three-games-to-none. Following a career high in appearances in 2004, Rivera did not throw during the offseason, unlike previous years. His 2005 season began on a low note. After missing time in spring training with elbow bursitis, he blew his first two save opportunities of the season against the Red Sox, marking four consecutive blown opportunities against Boston dating back to the previous postseason. Fans at Yankee Stadium booed Rivera, and baseball journalists speculated if his days as a dominant pitcher were over. He was subsequently cheered by Red Sox fans during pre-game introductions at Fenway Park the following week, in recognition of his struggles against the Red Sox. He responded to the ovation with a sense of humor by tipping his cap to the crowd. Rivera rebounded in dominating fashion and finished 2005 with his greatest season to that point. He was selected to the All-Star team, converted 31 consecutive save opportunities, and completed the season with 43 saves in 47 opportunities. He set new career bests in many statistical categories, including ERA (1.38) and walks plus hits per inning pitched, or WHIP (0.87). Rivera limited opposing hitters to a batting average against of .177, then the best mark of his closer career. In addition to winning a fourth AL Rolaids Relief Man Award, he placed second in voting for the AL Cy Young Award behind starter Bartolo Colón, and ninth for the AL MVP Award—his best finishes in voting for both awards. During the postseason, MLB announced the Latino Legends Team, a fan-voted all-time roster of the greatest Latino players; Rivera was named the team's relief pitcher. Rivera began 2006 with a 3.72 ERA and two losses in April, but his numbers improved in subsequent months. On June 6, he saved his 391st career game, passing Dennis Eckersley for the fourth-most saves in major league history. Rivera was selected to his third consecutive All-Star team with a 1.76 ERA and 19 saves entering the midseason break. He saved the AL's comeback victory in the 2006 All-Star Game for his third career All-Star save, tying him with Eckersley for the most ever. On July 16, Rivera achieved another milestone by becoming the fourth MLB pitcher to reach 400 saves. Although a throwing elbow strain sidelined Rivera for most of September, he finished the 2006 season with 34 saves in 37 opportunities and an ERA of 1.80—his fourth consecutive season with a sub-2.00 ERA. For a second consecutive year, fans voted him the Delivery Man of the Year. With his contract set to expire after the 2007 season, Rivera sought an extension with the Yankees during spring training. Team management refused to negotiate near the start of the season, prompting him to respond that he would consider free agency at the end of the year. In April, Rivera blew his first two save opportunities, compiled two losses, and surrendered nine earned runs in ​7 2⁄3 innings pitched. Concerned sportswriters attributed his struggles to infrequent use, as the Yankees presented him with few situations to enter a game. Rivera saved 30 of his next 32 opportunities and posted a 2.26 ERA over the final five months of the season. In addition, he passed John Franco for third place on the all-time saves list with his 425th career save. Still, Rivera finished 2007 with closer career worsts in earned runs (25), hits (68), and ERA (3.15), and his 30 saves in 34 opportunities were his second-lowest total since 1997. After the Yankees were eliminated from the playoffs in the opening round, Rivera stated his intentions to test the free agent market. He initially indicated that his decision of where to sign would be influenced by whether long-time manager Joe Torre was re-signed. Although Torre did not return, Rivera remained with the Yankees by agreeing to a three-year, $45 million contract, making him the highest-paid reliever in baseball history. Rivera rebounded in 2008 and began the year with 16 consecutive scoreless innings pitched and 28 consecutive save opportunities converted, both personal bests to start a season. His first-half performance, highlighted by a 1.06 ERA and 23 saves in as many opportunities, garnered him his ninth All-Star selection. Leading up to the 2008 MLB All-Star Game, which was held at Yankee Stadium in the venue's final year of existence, a few sportswriters proposed making Rivera the AL's starting pitcher as a tribute to him and his home ballpark. He instead was used as a reliever in the AL's extra-inning win. In the final month of the season, he recorded two milestones: on September 15, he recorded his 479th save to pass Lee Smith for second all-time in regular season saves; on September 21, in the final game at Yankee Stadium, Rivera threw the final pitch in the venue's history, retiring Brian Roberts of the Baltimore Orioles on a ground-out. After the Yankees missed the postseason for the first time in his career, Rivera disclosed that he had suffered from shoulder pain throughout the year. Tests revealed calcification of the acromioclavicular joint in his throwing shoulder, for which he underwent minor arthroscopic surgery in the offseason. Rivera's 2008 season was one of his best individual years. Along with a 1.40 ERA and 39 saves in 40 opportunities, he set career bests in multiple statistical categories, including WHIP (0.67), on-base plus slugging (OPS)-against (.422), batting average against (.165), save percentage (97.5%), walks (6), earned runs (11), and blown saves (1). He averaged 9.81 strikeouts per 9 innings pitched, his best mark as a closer. He pitched with such control that his 12.83 strikeout-to-walk ratio made him the second MLB pitcher ever to record a figure that high in a season (minimum 50 innings pitched). He placed fifth in the AL Cy Young Award voting. In his first 12 appearances of 2009, Rivera surrendered four home runs and had a 3.97 ERA, leading to speculation about his cutter's effectiveness and his shoulder's health at age 39. As the season progressed, his numbers improved, and he reached a milestone on June 28 by becoming the second pitcher with 500 regular season saves. In the same game, while batting against fellow closer Francisco Rodríguez, he collected his first career run batted in by walking with the bases loaded. With 23 saves in 24 opportunities and a 2.43 ERA in the season's first half, Rivera was named an All-Star for the tenth time. At the 2009 MLB All-Star Game, he set a record by saving his fourth career All-Star Game. In the season's second half, Rivera allowed earned runs in only two of his final 40 appearances, while he set a new personal best for consecutive save opportunities converted with 36. He finished the regular season with a 1.76 ERA, 44 saves in 46 opportunities, and a 0.90 WHIP. In the postseason, he pitched 16 innings, allowing one earned run and saving five games, and he clinched the Yankees' victory in the 2009 World Series against the Philadelphia Phillies—his fifth championship. He was the only closer who did not record a loss or blown save that postseason. Rivera collected several awards at season's end, including his third Delivery Man Award, his fifth AL Rolaids Relief Man Award, and the 2009 Sporting News Pro Athlete of the Year Award. Reflecting on the decade's end, ESPN.com's Jerry Crasnick called Rivera the most valuable major league pitcher of the previous 10 years. In 2010, Rivera and two of his "Core Four" teammates, Derek Jeter and Jorge Posada, became the first trio in any of the four major sports leagues in North America (MLB, NFL, NBA, or NHL) to play together on the same team for 16 consecutive seasons. Rivera began with one of his best first halves, compiling a 1.05 ERA, 20 saves in 22 opportunities, and 0.64 WHIP before the All-Star break, and in June, he set a personal best streak with 24 consecutive batters retired. He earned an 11th All-Star selection but withdrew from the game due to lingering oblique and knee injuries. In the second half, he was less effective—he struck out batters half as often, and in September, he compiled three blown saves and a 4.76 ERA. Rivera ended 2010 with a 1.80 ERA and 0.83 WHIP, numbers that were among his career bests, though his 33 saves in 38 opportunities and 6.75 strikeouts per 9 innings ratio were below his career averages. In the postseason, he pitched ​6 1⁄3 scoreless innings while saving three games. After becoming a free agent in the offseason, Rivera agreed to a two-year, $30 million contract to remain with the Yankees. That same offseason, Trevor Hoffman retired as the all-time regular season saves leader with a final tally of 601, leaving Rivera as the active leader in saves and 42 behind Hoffman's record to start 2011. Rivera's season was marked by several milestones. He broke the all-time record for games finished, and in May, he became the 15th pitcher to make 1,000 appearances and the first to do so with a single team. He was named an All-Star for the 12th time with a 1.85 ERA and 22 saves in 26 opportunities at the midseason break, but for the second consecutive year, he skipped the game to rest injuries. His pursuit of the saves record reached a climax in the final month of the season; on September 13, he collected his 600th save, making him just the second pitcher to accomplish the feat. Four days later, he saved his 601st game, tying him with Hoffman for the most in MLB history. Rivera broke the record on September 19 at Yankee Stadium by closing out a 6–4 win against the Twins, the final out by strikeout. After the game, Panamanian President Ricardo Martinelli called him to offer his congratulations. Rivera finished the season with a 1.91 ERA, a 0.90 WHIP, and 44 saves in 49 opportunities, making him the first pitcher over the age of 40 to save at least 40 games in a season. In the offseason, he underwent throat surgery to remove polyps from his vocal cords. Rivera began the 2012 season by blowing a save on Opening Day but followed it with eight scoreless innings and five saves for the remainder of April. After just nine appearances, his season was prematurely ended by a freak injury; prior to a May 3 game against the Kansas City Royals, Rivera's right knee buckled on the field's warning track while shagging balls during batting practice, causing him to tear his right anterior cruciate ligament (ACL). Speculation grew that the injury would end his career, as he had hinted at retirement in spring training. Rivera put those concerns to rest the following day when he announced his intentions to return, saying, "Write it down in big letters. I'm not going down like this." He successfully underwent ACL reconstructive surgery on June 12, while his meniscus, previously thought to have been damaged, did not need to be repaired. Rafael Soriano filled in as closer in Rivera's absence and saved 42 games in 46 opportunities. Rivera signed a one-year, $10 million contract in the offseason to remain with the team. Rivera acknowledges an ovation from fans and players at the 2013 All-Star Game in his final All-Star appearance. His former manager Joe Torre is visible in the crowd (second from right). After successfully rehabilitating his knee in the offseason, the 43-year-old Rivera announced on March 9, 2013, that he would retire after the 2013 season, his 19th in the major leagues. Throughout his final year, Rivera spent time during visits to each ballpark meeting privately with fans and unsung team employees to hear their stories and thank them for supporting baseball. He explained: "It was important for me to meet the people who make baseball what it is, the people who work in the game every day. They have given me far more than I have given them." Each opposing team returned the favor by honoring Rivera with a gift during his final visit to their city. In Cleveland, the Indians teamed up with the Rock and Roll Hall of Fame to present Rivera with a gold record of his entrance song "Enter Sandman". The Minnesota Twins commissioned a rocking chair made of broken bats, many broken personally by Rivera's cutter, called the "Chair of Broken Dreams". The rival Boston Red Sox gave him a painting and several artifacts from Fenway Park. Many teams made donations to the Mariano Rivera Foundation, the pitcher's charitable organization. Corporate sponsors of the Yankees paid tribute as well. Delta Air Lines dedicated a Boeing 757 airplane with Rivera's signature and uniform number 42 on the exterior, while Hard Rock Cafe retired "Enter Sandman" from its song system at all locations except for its Yankee Stadium restaurant. Rivera's 10 saves in 10 opportunities in April were his highest total for the opening month of a season. He converted his first 18 save attempts of the season until blowing a save against the Mets on May 28; it was the first time that he blew a save and lost a game without recording an out. Rivera entered the midseason break with 30 saves in 32 opportunities and a 1.83 ERA, and he was named an All-Star for the 13th time in his career, the second-most All-Star selections for a pitcher behind Warren Spahn's 17. During the All-Star Game, held at Citi Field in New York, Rivera was called upon to pitch in the eighth inning for his final All-Star appearance. As he trotted onto the field, players from both teams remained near their dugouts and joined fans in giving Rivera a standing ovation as he stood alone on the field. Rivera retired all three batters he faced, preserving his 0.00 career ERA in All-Star Games. He was named the All-Star Game MVP, making him the first reliever selected to an All-Star team to ever receive the award, as well as the first pitcher since Pedro Martínez in 1999 and the second Yankee ever after Derek Jeter in 2000. He became the first MLB player to be named the MVP of a World Series, League Championship Series, and All-Star Game. Rivera's performance dipped in the second half of the season, as he blew five save opportunities in the last two months, including three consecutive chances for the first time in his career. In a Fox Sports documentary chronicling his final season, entitled Being: Mariano, Rivera said that his farewell to baseball had mentally and physically drained him and that by September, he had "no desire" left for the sport. On September 22, 2013, a day that Mayor of New York City Michael Bloomberg declared "Mariano Rivera Day", the Yankees held a 50-minute pre-game tribute to Rivera at Yankee Stadium. In a ceremony attended by former teammates, Yankees staff, and members of Jackie Robinson's family, Rivera's uniform number 42 was retired by the team, making him the first active Yankee to receive that honor. Metallica performed "Enter Sandman" live as he walked onto the field during the festivities. The team presented a video montage and several gifts to Rivera before he addressed the crowd to offer his thanks. Four days later against the Tampa Bay Rays, he pitched in the final game of his career before a home crowd at Yankee Stadium. Entering in the eighth inning to a pre-recorded introduction by late Yankees public address announcer Bob Sheppard, Rivera pitched ​1 1⁄3 innings without allowing a baserunner. In the ninth inning, after retiring Yunel Escobar on a pop fly for the second out, Rivera was removed from the game; with permission from the umpires, Yankees manager Joe Girardi ceremonially delegated the substitution duty to Rivera's long-time teammates Andy Pettitte and Derek Jeter. After they reached the mound to make the pitching change, the normally reserved Rivera tearfully embraced his teammates for nearly a minute. Walking off the field to a standing ovation from fans and players, he saluted the crowd and then took a curtain call. After the game, he visited the mound for a final time and grabbed a handful of dirt as a memento. Rivera finished his final season with a 2.11 ERA, 1.05 WHIP, and 44 saves in 51 opportunities, earning him the AL Comeback Player of the Year Award, among several awards. During the World Series, he was honored as the 13th recipient of the Commissioner's Historic Achievement Award for his accomplished career and for being "a great ambassador of the game". Rivera prepares to throw a cut fastball in 2007. Rivera's signature pitch was a cut fastball or "cutter", which exhibited lateral movement towards left-handed hitters similar to that of a slider but with the velocity of a fastball. The sharp, late movement of Rivera's cutter prevented hitters from making contact with the ball on the sweet spot of their bats, leading to them not only making weak contact on batted balls but also frequently breaking their bats. According to a tally by columnist Buster Olney, Rivera broke 44 bats during the 2001 regular season. Chipper Jones, who once witnessed teammate Ryan Klesko break three bats in one plate appearance against Rivera in the 1999 World Series, called the pitch a "buzz saw". Rivera's long fingers and loose wrist allowed him to impart more spin on the ball, contributing to the pitch's movement. Describing his grip of the cutter, he said, "it's really a four-seam fastball with pressure on the middle finger". By adjusting the pressure that he applied to the ball with his fingertips, he could vary the pitch's movement. Rivera threw four-seam and two-seam fastballs as complementary pitches but primarily used his cutter; according to baseball statistics website Fangraphs, 83.3% of his pitches in 2010 were cutters. All three pitches typically reached a velocity in the low-to-mid 90s mph. Early in his major league career, Rivera was a "power pitcher" who relied on an overpowering four-seam fastball that topped out at 96 mph (154 km/h) to retire hitters. By enticing them to swing and miss at pitches high in the strike zone, he accumulated strikeouts at a high rate. Rivera altered his pitching style after accidentally discovering the cutter. One day in June 1997 during one of his daily warm-up tosses with teammate Ramiro Mendoza, Rivera noticed that his fastballs were moving sharply and unpredictably, a problem that began to occur in games as well. After unsuccessfully spending a month trying to eliminate the movement, Rivera relented and incorporated the cutter into his pitching repertoire, making it one of his primary pitches in 1998. When asked about the pitch's origin, he explained, "It was just from God. I didn't do anything. It was natural." As he came to rely on the cutter, Rivera began to record more outs on batted balls. Consequently, his strikeout rate decreased in subsequent years, dropping from 10.87 strikeouts per 9 innings in 1996 to 5.3 in 1998, but at the benefit of more efficiency; his pitches per inning rate dropped from 18.7 in 1995 to 14.9 in 1998. Rivera credited his improved efficiency and consequent longevity in baseball to his long-time pitching coach Mel Stottlemyre. Rivera had an impeccable ability to accurately locate pitches and consistently throw strikes, particularly on the inside and outside edges of the strike zone. This strength offset his reliance on one pitch and hitters' anticipation of it. His former catcher Joe Girardi said, "He was so easy to catch because he always put the ball right there. I don't think there's ever been a pitcher that great who was so easy to catch." Rivera's 4.10 career strikeout-to-walk ratio in the regular season ranks tenth-best in major league history. His control was a byproduct of his smooth, easily repeated pitching motion, which some opposing hitters found to be deceptive. One such player, Darrin Fletcher, said in 1999 that Rivera "almost kind of lulls you to sleep with his delivery. It gives you a false sense of security, and then the ball is on you and it's exploding." "You know what's coming, but you know what's coming in horror movies too. It still gets you." Although switch-hitters usually bat left-handed against right-handed pitchers to better see the ball's release point, switch-hitters occasionally batted right-handed when facing the right-handed Rivera to avoid being jammed on their hands by his cutter. Similarly, some managers, such as Bruce Bochy in the 1998 World Series, sent right-handed batters to pinch hit for left-handers against Rivera, thinking that the cutter would be more difficult for lefties to hit. Opposing hitters occasionally chose to face Rivera with backup or batting practice bats, rather than risk breaking their best ones against his cutter. Rivera was considered an exceptional athlete, distinguished by his slender physique and durability. His propensity to shag balls during batting practice convinced scouts he could be a top AL center fielder. Olney compared Rivera's regimen of physical preparation and guidelines for staying healthy to Satchel Paige's "Rules for Staying Young". Former teammate Alex Rodriguez expressed amazement at Rivera's athleticism and claimed that the pitcher completed a 35-inch vertical jump at Yankees training camp at age 41. Rivera exhibited a reserved demeanor on the field that contrasted with the emotional, demonstrative temperament of many of his peers. Hall of Fame closer Goose Gossage said that Rivera's composure under stress gave him the appearance of having "ice water in his veins". Commenting on his ability to remain focused in pressure situations, Rivera said, "When you start thinking, a lot of things will happen... If you don't control your emotions, your emotions will control your acts, and that's not good." His ability to compartmentalize his successes and failures impressed fellow reliever Joba Chamberlain, who said, "He's won and lost some of the biggest games in the history of baseball, and he's no worse for the wear when he gives up a home run." Rivera explained the need to quickly forget bad performances, saying "the game that you're going to play tomorrow is not going to be the same game that you just played." Derek Jeter called him the "most mentally tough" teammate with whom he had ever played. During his playing career, Rivera was regarded as a team leader within the Yankees organization, often mentoring younger pitchers and counseling teammates. He had a team-first mindset and deferred most discussions about individual accolades to team goals and his teammates, praising them for making his presence in games possible. When once asked to describe his job, Rivera put it simply, "I get the ball, I throw the ball, and then I take a shower." "When you go back and look at his career and what he's done with that one pitch, I don't think there's a greater achievement in this game than that. To go through major league hitters and dominate for all those years, it's one of the greatest feats I'll ever look back on... I don't think people realize how incredible it really is. It will never be duplicated, ever." Rivera was a dominant reliever throughout his career, pitching with a consistency and longevity uncharacteristic of a role commonly marked by volatility and high turnover. In his 17-year tenure as the Yankees' closer, Rivera compiled considerable career numbers. A 13-time All-Star, he is the major leagues' all-time regular season leader in saves (652) and games finished (952). He pitched in 1,115 regular season games, which is fourth-most in MLB history, the most in AL history, and the most by a right-handed pitcher. Rivera holds or shares several records for the most seasons of reaching various save milestones, including seasons with at least: 20 saves (sixteen); 25 saves (fifteen consecutive, sixteen non-consecutive); 30 saves (nine consecutive, fifteen non-consecutive); 35 saves (twelve); 40 saves (nine); and 50 saves (two). Rivera's career ERA (2.21) and WHIP (1.00) are the lowest of any MLB pitcher in the live-ball era (minimum 1,000 innings pitched), making him one of the top pitchers since 1920 at preventing hitters from reaching base and scoring. He recorded an ERA under 2.00 in 11 seasons, tying him with Walter Johnson for the most such seasons (minimum 60 innings pitched each). Rivera also ranks first in career adjusted ERA+ (205), a statistic that adjusts ERA for league and ballpark to allow comparisons of pitchers on the same baseline. In addition to his strong regular season numbers, Rivera excelled in the postseason, recording an 8–1 win–loss record and a 0.76 WHIP. He holds numerous postseason records, including lowest career ERA (minimum 30 innings pitched) (0.70), most saves (42), most consecutive scoreless innings pitched (​33 1⁄3), most consecutive save opportunities converted (23), and most games pitched (96). As of 2018, Rivera has saved twice as many postseason games as any other pitcher; Brad Lidge, with 18, had the next-highest total. Joe Torre, who managed Rivera for most of his career, said, "Let's face it. The regular season for Mo is great, but that's the cupcakes and the ice cream. What separates him from everybody else is what he's done in the postseason." Rivera's dominance in the postseason often led to him being utilized for two-inning appearances, as he saved a record 14 postseason games in this manner—more than all other relievers combined during his career. He ranks first all time in win probability added in the postseason with 11.7, nearly three times the total of the next-closest player. In a 2009 ESPN.com poll, Rivera was voted one of the top five postseason players in MLB history. 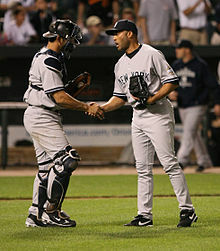 Rivera (right) shakes Jorge Posada's hand after finishing a game in 2009. Rivera achieved a reputation as an all-time great reliever among baseball experts and his peers. Hall of Fame starter-turned-closer Dennis Eckersley called him "the best ever, no doubt", while Trevor Hoffman said he "will go down as the best reliever in the game in history". Torre said, "He's the best I've ever been around. Not only the ability to pitch and perform under pressure, but the calm he puts over the clubhouse." Writer Tom Verducci said, "Rivera is definitively the best at his position by a wider margin than any player at any position in the history of baseball. There is Rivera, a gulf, and then every other closer." He compared Rivera's reputation for being the best at his position to that of Michael Jordan and Wayne Gretzky. MLB Commissioner Bud Selig said, "Clearly unequivocally, he's the greatest relief pitcher of all time, and did it in a way that was remarkable." Speaking about Rivera's looming presence at the end of games, Alex Rodriguez said, "He's the only guy in baseball who can change the game from a seat in the clubhouse or the bullpen. He would start affecting teams as early as the fifth inning, because they knew he was out there. I've never seen anyone who could affect a game like that." Gossage said that Rivera "might be the greatest closer of all-time" but suggested that the modern closer's job has become too specialized and easy compared to multiple-inning "firemen" from Gossage's era; Rivera had only one regular season save of seven-plus outs in his career, whereas Gossage logged 53. In 2016, ESPN.com ranked Rivera 49th on its list of the greatest MLB players. Mariano Rivera's number 42 was retired by the New York Yankees in 2013. Rivera is well respected throughout baseball for his professionalism. Fellow closer Joe Nathan said, "I look up to how he's handled himself on and off the field... You never see him show up anyone and he respects the game. I've always looked up to him and it's always a compliment to be just mentioned in the same sentence as him." Michael Young said of Rivera, "I respect Mo more than anybody in the game. The guy goes out there, gets three outs and shakes [Jorge] Posada's hand. You appreciate someone who respects the game like he does, respects the people he plays with and against, and obviously his results speak for themselves." In a Sports Illustrated cover story about Rivera that was published in the final week of his career, Verducci said of the pitcher, "Few players in any sport have retired with more reverence from his peers." Rivera was the last MLB player to wear the uniform number 42 on a regular basis; at the time of his retirement, he was the only active player still grandfathered by the league to wear Jackie Robinson's retired number. Speaking about Rivera's connection to her husband, Robinson's widow Rachel said: "[Rivera] carried himself with dignity and grace, and that made carrying the number a tribute to Jack... I've always been proud and pleased that Mariano was the one chosen to wear that number because I think he brought something special to it." Presenting him with the Commissioner's Historic Achievement Award, Selig said: "Throughout his illustrious career, he has represented his family, his country, the Yankees and all of Major League Baseball with the utmost class and dignity. It is wholly appropriate that Mariano was the last Major League player to wear Jackie Robinson's sacred number 42." Rivera's cut fastball was a respected pitch among major league hitters. Jim Thome called it "the single best pitch ever in the game". David Ortiz echoed his sentiment, saying: "His cutter was the single best pitch I've ever seen, but the really amazing thing is how he was able to do it for so many years. Are there guys now who have stuff as nasty as Mariano? Maybe for one year, two years. But nobody could maintain it like he did." In 2004, ESPN.com ranked his cutter as the best "out pitch" in baseball. Olney described his cut fastball as "the most dominant pitch of a generation". Several of Rivera's colleagues credit him with popularizing the cutter among major league pitchers. Fellow closer Jason Isringhausen, who adopted the pitch later in his career, said: "I think he's been an influence on everybody that throws it. Everybody saw what [Rivera] could do, basically with one pitch. Nobody could throw it like he did, but now, you talk about the evolution of the cutter—just ask hitters about it and they tell you everybody's throwing one. And they hate it." Al Leiter, whose signature pitch was a cutter, echoed Isringhausen's sentiments: "Now, everybody throws it and Mo has had a huge influence on that. Pitchers watched him and marveled at what he did with one pitch." In 2008, Roy Halladay consulted Rivera for help with his own cutter and traced the reliever's suggested grip onto a baseball as a visual reference; Rivera's willingness to help an opponent drew a playful fine from his teammates in the Yankees' kangaroo court. Rivera was elected to the Baseball Hall of Fame by the BBWAA on January 22, 2019, in his first year of eligibility. He became the first player in major league history to be elected unanimously, appearing on all 425 ballots; the previous record for election percentage was held by Ken Griffey Jr., who received 99.3% of votes in 2016. Rivera was just the second Panamanian to be elected to the Hall of Fame after Rod Carew, and just the eighth relief pitcher. Rivera jogging with his son, Mariano III, before a game in 2008. Mariano III was drafted by the Washington Nationals in the 4th round of the 2015 MLB draft. Rivera and his wife Clara have known each other since elementary school, and they were married on November 9, 1991. They have three sons: Mariano III, Jafet, and Jaziel. The family lived in Panama until 2000, when they relocated to Westchester County, New York; they currently reside in Rye, New York. Mariano III pitched for Iona College in New Rochelle, not far from his home. He was drafted by the Yankees with the 872nd pick in the 2014 MLB draft, but decided to return to Iona for his junior year. In the following year's draft, Mariano III was selected by the Washington Nationals in the 4th round with the 134th overall pick. Over the course of his professional career, Rivera learned English, beginning in 1991 with the Greensboro Hornets, when he realized none of his teammates spoke his native Spanish. He is now a proponent of Latino players learning English and of American press members learning Spanish, in order to bridge the cultural gap. Rivera became a naturalized citizen of the United States in October 2015, and was recognized as an Outstanding American by Choice during the ceremony. In February 2019, a Panamanian woman accused Rivera of failing to financially support her two children, a boy and a girl then aged 11 and 15, that were allegedly conceived with Rivera out of wedlock. Five lawsuits were filed in his native country demanding child support that he allegedly stopped paying two years earlier. He called the demands "unfounded." Rivera is a devout Christian. During his childhood, neither he nor his family attended church, but after a born-again experience around the age of 21, Rivera became religious and converted from Catholicism to a Pentecostal faith. His parents followed his lead after seeing the difference it made in him. Rivera believes that God has a reason for everything that happens. For example, he found his failure in Game 7 of the 2001 World Series easier to deal with when he learned of the consequences it had for teammate Enrique Wilson. Had the Yankees won the series, Wilson would have remained in New York for the championship parade and would have departed for his native Dominican Republic on American Airlines Flight 587, which crashed shortly after takeoff and killed all 260 people aboard. Rivera told Wilson, "I am glad we lost the World Series, because it means that I still have a friend." Rivera's pitching glove was inscribed "Phil. 4:13", in reference to the Bible verse Philippians 4:13 ("I can do all things through Christ, who strengthens me"). Rivera is involved with philanthropic efforts in several countries. The Mariano Rivera Foundation, a 501(c)(3) organization established in July 1998, helps provide underprivileged children with an education, distributing more than $500,000 annually in the US and Rivera's native Panama through church-based institutions. His contributions in Panama include building an elementary school, providing Christmas gifts to children, and developing a program that provides computer access and adult mentors to youths. In addition to funding church start-ups in Panama, Mexico, the Dominican Republic, California, and Florida, Rivera opened a church in New Rochelle in March 2014 that his foundation renovated at a cost of $3 million. The church, named Refugio de Esperanza ("Refuge of Hope"), has his wife Clara as its pastor and hosts a Pentecostal congregation that previously met at the Rivera home. For years, the Mariano Rivera Foundation was a private institution, but during his final baseball season in 2013, many teams wanted to commemorate the pitcher by donating to his foundation. As a result, he formed a public version of it; Naomi Gandia was appointed executive director and works out of their headquarters in Stanton, Delaware. Since retiring from baseball, Rivera has dedicated himself to philanthropy and his churches. In 2014, he and Clara created a scholarship in their names that they have awarded to students at the local College of New Rochelle. Recently, Rivera has organized an annual charity golf tournament that benefits White Plains Hospital and his foundation. He also holds multiple events annually in Delaware, including giveaways of backpacks with school supplies to children, distribution of turkey dinners during the holiday season, and the "Mariano Rivera Foundation 5K & Kids Run". In 2012, the Giving Back Fund estimated that Rivera donated $627,500 to charity in 2010, ranking him as the 25th-most generous celebrity on a list that the fund compiled. He won the 2013 Marvin Miller Man of the Year Award, which is given to the MLB player "who inspires others through his on-field performances and contributions to his community". Rivera was an investor in two New York area restaurants: "Clubhouse Grill", which opened in New Rochelle in 2006 as "Mo's New York Grill"; and Siro's, which opened in Manhattan in 2012. Both restaurants have since closed. In 2015, he opened a Toyota and Scion car dealership in Mount Kisco, New York. Rivera has been a celebrity spokesman for several companies, including: Nike sports apparel; Canali, a premium men's clothing company, as their first athlete spokesperson; Skechers footwear; and Hartford Financial Services Group, Inc. Rivera donated all his earnings from endorsement deals to his foundation. A 2011 list by the marketing firm Nielsen ranked him as the second-most marketable player in baseball behind only Derek Jeter; the list accounted for personal attributes such as sincerity, approachability, experience, and influence. Based on sales figures from Majestic Athletic, Rivera had the 18th-best-selling MLB jersey in 2011, and the top-selling jersey in the second half of 2013. He earned approximately $169.6 million in salary during his baseball career, ten percent of which he donated to his foundation. 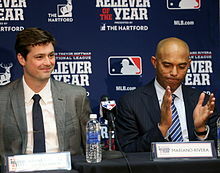 Rivera (right) at the presentation of the 2015 AL Reliever of the Year Award to Andrew Miller. The award was named in Rivera's honor the year prior. In March 2014, Rivera was twice recognized for his philanthropic efforts, receiving the ROBIE Humanitarian Award from the Jackie Robinson Foundation, as well as a Jefferson Award for Public Service. Later that month, the "Legends Series", comprising two MLB exhibition games between the Yankees and Miami Marlins, was played in Rivera's native Panama to "honor [his] legacy"; he helped promote the games, which were supplemented by charitable events and a gala benefiting his foundation. On April 9, 2014, MLB announced that a new annual award for relief pitchers, the Reliever of the Year Award, would replace the existing Delivery Man of the Year Award, and that the AL honor would be named after Rivera. The following month, a section of River Avenue bordering Yankee Stadium at 161st Street was renamed "Rivera Avenue" in the pitcher's honor. This coincided with the release of his autobiography, The Closer: My Story, co-authored with Wayne Coffey. New York University bestowed an honorary Doctor of Humane Letters degree upon Rivera during its commencement ceremony at Yankee Stadium on May 21, 2014. During the 2015 Little League World Series, he was inducted into the Little League Hall of Excellence. The Yankees dedicated a plaque to Rivera in Yankee Stadium's Monument Park on August 14, 2016. In May 2018, Rivera was nominated to co-chair the President's Council on Sports, Fitness, and Nutrition. ^ a b Ziegel, Vic (July 14, 2006). "Mo Gets More on his Plate". New York Daily News. Retrieved February 26, 2013. ^ a b Waldstein, David (September 26, 2013). "First Steps Made on Beach". The New York Times (New York ed.). p. B12. Retrieved September 27, 2013. ^ a b c Schoenfield, David (January 22, 2019). "Mariano Rivera, Edgar Martinez, Roy Halladay and Mike Mussina joining Hall of Fame". ESPN.com. Retrieved January 22, 2019. ^ a b c d e f g h i Corcoran, Cliff (September 20, 2013). "42 things you need to know about Mariano Rivera". SI.com. Retrieved August 21, 2014. ^ Zamorano, Juan (September 20, 2013). "Rivera's long ride from a Pacific fishing village". Omaha.com. Retrieved January 10, 2016. ^ Reported by Tom Rinaldi (May 11, 2010). "Coming Home". E:60. ESPN. ^ Red, Christian (April 11, 2013). "Yankees closer Mariano Rivera reveals his passions outside of baseball, his favorite player growing up and the toughest batter he's ever faced". New York Daily News. Retrieved May 9, 2015. ^ a b c d e f g h Antonen, Mel (October 9, 2006). "Yanks' Rivera continues to learn". USA Today. Retrieved March 4, 2013. ^ a b c d e Bamberger, Michael (March 24, 1997). "Strikeouts by the Boatload". Sports Illustrated. Vol. 86 no. 12. pp. 50–53. Retrieved August 21, 2014. ^ a b c Red, Christian (March 13, 2010). "Modern Yankee Heroes: From humble beginnings, Mariano Rivera becomes greatest closer in MLB history". New York Daily News. Retrieved March 17, 2014. ^ a b Hermoso, Rafael (August 31, 1998). "Where Rivera goes for relief takes hat off to Panama". New York Daily News. Retrieved February 26, 2013. ^ a b c O'Connor, Ian (September 18, 2013). "Mariano Rivera saves his best for last". ESPN.com. Retrieved May 14, 2017. ^ Castillo, Jorge (March 16, 2014). "Former Yankee Mariano Rivera out to revive thirst for baseball in Panama". NJ.com. Retrieved March 17, 2014. ^ Frezza, Harry (June 13, 2014). "Few insights by Rivera not enough to save 'The Closer'". APP.com. Retrieved April 6, 2018. ^ a b c Red, Christian (January 19, 2019). "Mariano Rivera, the humble son of a fisherman and the greatest closer in baseball history, set to join other Yankee legends in Cooperstown". New York Daily News. Retrieved January 21, 2019. ^ a b Bella, Timothy (January 23, 2019). "'Help! Miguel is hurt! ': Baseball's first unanimous Hall of Famer overcame a sardine-boat tragedy". The Washington Post. Retrieved February 5, 2019. ^ Starr, Michael (May 11, 2010). "Heading home". New York Post. Retrieved February 11, 2019. ^ Gere, Richard (April–May 2012). "Richard Gere Interviews Mariano Rivera". Gotham. Retrieved August 15, 2015. ^ Miller, Randy (January 22, 2019). "Yankees' Mariano Rivera's road to Hall of Fame: From commercial fisherman to Cooperstown". NJ.com. Retrieved February 4, 2019. ^ Rivera, Mariano; Coffey, Wayne (May 6, 2014). "Former Yankees closer Mariano Rivera recalls humble start to career". New York Daily News. Retrieved February 4, 2019. ^ a b c "From humble start, Rivera closes as baseball great". ESPN.com. Associated Press. September 27, 2013. Retrieved May 14, 2017. ^ Teitelbaum, Ben (May 15, 2014). "Speed Read: Highlights From Mariano Rivera's Memoir, 'The Closer'". The Daily Beast. Retrieved April 6, 2018. ^ a b c d e "Mariano Rivera Minor League Statistics & History". Baseball-Reference.com. Retrieved March 10, 2017. ^ BA Staff (January 21, 2019). "Mariano Rivera: Before He Was A Hall Of Famer". Baseball America. Retrieved April 6, 2019. ^ a b O'Connell, Jack (September 6, 1992). "Yankees develop some arm musicle". Hartford Courant. p. D7. ^ a b Corcoran, Cliff (March 7, 2014). "Thanks, Frank Jobe: The five best post-Tommy John surgery careers for pitchers". SI.com. Retrieved April 6, 2019. ^ Harper, John (June 29, 2009). "At start of Mariano Rivera's Yankee career, Gene Michael almost traded him". New York Daily News. Retrieved February 26, 2013. ^ Sherman, Joel (April 2, 2012). "Yankees closer Rivera took unbelievable journey". New York Post. Retrieved April 6, 2019. ^ O'Connor, Ian (September 19, 2011). "From obscurity to history, only one Mo". ESPN.com. Retrieved May 14, 2017. ^ Heyman, Jon (March 7, 2013). "Mariano: Great stats, greater story add up to the greatest ever". CBSSports.com. Retrieved April 6, 2018. ^ O'Connell, Jack (May 21, 1995). "Key's shoulder needs a break". Hartford Courant. p. B5. ^ "Rivera Comes Up Big As Yankees Drop Sox". The Washington Post. Associated Press. July 5, 1995. p. D4. ^ a b "A decade later, Rivera still dominates; 'Best ever,' Eckersley says". ESPN.com. Associated Press. July 17, 2006. Retrieved May 14, 2017. ^ a b c d e f g Olney, Buster (June 28, 2004). "The Confidence Man: Inside the mind of baseball's greatest closer, Mariano Rivera". New York. Retrieved May 18, 2008. ^ Hertzel, Bob (July 5, 1995). "Start of Something Big?". The Record. p. S1. ^ a b Vitale, Josh (August 21, 2013). "With all of Mo's saves, one start stands out". MLB.com. Retrieved April 6, 2018. ^ a b c d e f g h "Mariano Rivera Stats". ESPN.com. Retrieved May 14, 2017. ^ a b c d e f g Traub, James (June 28, 2010). "Mariano Rivera, King of the Closers". The New York Times. Retrieved June 30, 2010. ^ Smith, Claire (April 29, 1996). "Rivera Completes 'No-Hitter' In Victory". The New York Times. Retrieved June 29, 2009. ^ Dottino, Paul (October 19, 1996). "Yankee Dates to Remember". The Record. p. W16. ^ Goddard, Joe (May 6, 1996). "Guillen's Presence Still Means a Lot to Bevington". Chicago Sun-Times. ^ Ehalt, Matt (September 17, 2011). "Rivera's first save a mystery". ESPN.com. Retrieved May 14, 2017. ^ a b Jaffe, Jay (November 26, 2018). "JAWS and the 2019 Hall of Fame Ballot: Mariano Rivera". Fangraphs. Retrieved January 18, 2019. ^ a b c d e f g h i "Mariano Rivera Stats, Fantasy, and News: Stats – MLB Postseason Cumulative". MLB.com. Retrieved August 15, 2015. ^ a b Curry, Jack (October 27, 1996). "A Return to Glory". The New York Times. Retrieved June 26, 2013. ^ "1996 Awards Voting". Baseball-Reference.com. Retrieved March 28, 2011. ^ a b Hoch, Bryan (April 15, 2007). "Rivera 'blessed' to wear No. 42". MLB.com. Archived from the original on November 12, 2014. Retrieved November 12, 2014. ^ "Mariano Rivera 1997 Pitching Gamelogs". Baseball-Reference.com. Retrieved March 10, 2017. ^ Michaux, Scott (October 10, 2008). "Waynesboro native steps into spotlight". Augusta Chronicle. Retrieved April 6, 2018. ^ a b Kruth, Cash (August 28, 2013). "First All-Star save was easy as 1-2-3 for Mariano". MLB.com. Retrieved April 6, 2018. ^ a b c d e f g h i j Verducci, Tom (October 5, 2009). "Mariano Saves". Sports Illustrated. Vol. 111 no. 13. Retrieved August 21, 2014. ^ a b c d e f g h i j k l m n o p q r s t u v "Mariano Rivera Pitching Statistics and History". Baseball-Reference.com. Retrieved September 7, 2011. ^ Olney, Buster (April 24, 1998). "All Seems Normal, For Now, In Bronx". The New York Times. Retrieved July 11, 2013. ^ Sherman, Joel (October 23, 2000). "Bullpens Hold Key to Series Success – Solid Relief Corps Make Bombers Tough to Beat". New York Post. Retrieved October 23, 2013. ^ a b Olney, Buster (October 20, 2001). "Rivera Makes Finishing A Formality". The New York Times. pp. S1, S4. Retrieved April 12, 2012. ^ a b Olney, Buster (February 18, 2001). "Rivera Aiming to Be Unpredictable". The New York Times. Retrieved July 2, 2013. ^ a b Van Dyck, Dave (October 22, 1998). "A Bronx cheer: Yanks sweep Padres, win record 24th World Series". Chicago Sun-Times. p. 128. ^ Botte, Peter (March 21, 1999). "Spring in Mariano's Step". New York Daily News. Retrieved July 2, 2013. ^ a b c d e f "All-time and Single-Season Postseason Pitching Leaders". Baseball-Reference.com. Retrieved September 6, 2011. ^ a b "Mariano Rivera 1999 Pitching Splits". Baseball-Reference.com. Retrieved March 10, 2017. ^ Hoch, Bryan (September 15, 2011). "Cue the 'Sandman': Mariano, song synonymous". MLB.com. Archived from the original on November 12, 2014. Retrieved November 12, 2014. ^ "Mariano Rivera 1999 Pitching Gamelogs". Baseball-Reference.com. Retrieved March 10, 2017. ^ a b c Olney, Buster (October 29, 1999). "Movement on Rivera's Pitches Is Tough on Bats". The New York Times. Retrieved April 12, 2010. ^ "1999 Awards Voting". Baseball-Reference.com. Retrieved March 10, 2017. ^ a b c Curry, Jack (October 29, 2000). "Closing Thoughts: Rivera Remains the Infallible One". The New York Times. Retrieved September 6, 2011. ^ Olney, Buster (February 20, 2000). "Rivera Loses Ruling on Salary, but Takes It in Stride". The New York Times. Retrieved May 12, 2009. ^ "Long Day Benefits Yankees". Los Angeles Times. Associated Press. July 9, 2000. sec. Sports, p. 7. Retrieved February 28, 2016. ^ Gloster, Rob (October 9, 2000). "Not over the hill yet". Pittsburgh Post-Gazette. p. C4. Retrieved August 1, 2013. ^ Edes, Gordon (February 17, 2010). "Jonathan Papelbon learns from best". ESPN.com. Archived from the original on July 29, 2017. Retrieved October 20, 2017. ^ Klapisch, Bob (September 27, 2001). "Yankees' Achilles Heel". The Record. ^ Bryant, Howard (October 8, 2001). "El Duque Regains October Form". The Record. ^ Schmuck, Peter (October 27, 2001). "Carried By Their Arms". The Baltimore Sun. p. C1. Retrieved September 7, 2011. ^ "Mariano Rivera Postseason Pitching Gamelogs". Baseball-Reference.com. Retrieved March 10, 2017. ^ a b c Vass, George (October 2002). "Last At-Bat Heroics: Every Hitter's Post-Season Dream". Baseball Digest. Vol. 61 no. 10. pp. 31–38. ^ Kepner, Tyler (May 10, 2002). "Rivera Sets a Yankee Record With His 225th Save, but Not Without a Scare". The New York Times. Retrieved October 2, 2013. ^ Kepner, Tyler (August 20, 2002). "Rivera Is Out With Injury For 3rd Time". The New York Times. Retrieved May 25, 2008. ^ "Mariano Rivera 2002 Pitching Splits". Baseball-Reference.com. Retrieved March 10, 2017. ^ Bryant, Howard (August 20, 2002). "Sore shoulder shelves Rivera again". The Record. p. S1. ^ Haudricourt, Tom (February 9, 2003). "Yankees Spring Training Preview". The Record. ^ Habib, Daniel J. (March 31, 2003). "New York Yankees: 2003 Preview". Sports Illustrated. Vol. 98 no. 13. Retrieved August 21, 2014. ^ a b Kepner, Tyler (May 1, 2003). "Mondesi's Slam and Rivera's Debut Frame Victory". The New York Times. Retrieved May 31, 2008. ^ Blum, Ronald (July 16, 2003). "Yanks may acquire Benitez from Mets". Star-Gazette. p. 4B. ^ Nowak, Joey (September 9, 2013). "Mo puts finishing touch on Rocket's 300th". MLB.com. Retrieved April 6, 2018. ^ Sheinin, Dave (August 17, 2003). "Giambi's Homer in 12th Sinks O's; With Mixed-Up Lineup, Baltimore Misses Chance to Tie in Bottom of Inning". The Washington Post. p. E7. ^ a b Kepner, Tyler (September 30, 2003). "Rivera on the Mound, Money in the Bank". The New York Times. Retrieved June 15, 2014. ^ a b "Yankees reliever named MVP after 3 innings". ESPN.com. Associated Press. October 17, 2003. Retrieved May 14, 2017. ^ Silverman, Michael (October 17, 2003). "Rivera goes extra mile; Series MVP pitches three clutch frames". Boston Herald. p. 130. ^ Klapisch, Bob (October 26, 2003). "October magic runs out on Yanks". The Record. p. S1. ^ a b "Yankees' Rivera inks extension". CBC Sports. March 23, 2004. Retrieved October 9, 2013. ^ "Rivera Earns His 300th Save". The Washington Post. Associated Press. May 30, 2004. sec. Sports, p. E07. ^ "Top 10 Single Season Saves Leaders". SI.com. Retrieved December 9, 2014. ^ "2004 Awards Voting". Baseball-Reference.com. Retrieved March 10, 2017. ^ Klapisch, Bob (October 17, 2004). "Mariano is why the Yanks can dream of another title". The Record. p. S1. ^ a b c "Boston's blow out caps unequaled comeback". ESPN.com. Associated Press. October 20, 2004. Retrieved May 14, 2017. ^ Gee, Michael (March 30, 2005). "Sox have Rivera's number". Boston Herald. p. 96. ^ a b c Kepner, Tyler (April 8, 2005). "Fellow Pitchers Feel Rivera's Red Sox Pain". The New York Times. Retrieved April 6, 2018. ^ Cristodero, Damian (April 10, 2005). "Boo birds lose perspective with closer Rivera". St. Petersburg Times. p. C4. Archived from the original on March 3, 2016. Retrieved June 18, 2014. ^ a b Klapisch, Bob (April 7, 2005). "Red Sox show Rivera who's boss". ESPN.com. Retrieved May 14, 2017. ^ Feinsand, Mark (April 11, 2005). "Rivera has some fun with Sox fans". MLB.com. Archived from the original on November 12, 2014. Retrieved November 12, 2014. ^ a b O'Connor, Ian (November 8, 2005). "Rivera's season stellar despite Cy Young results". USA Today. Retrieved February 26, 2013. ^ "Mariano Rivera 2005 Pitching Gamelogs". Baseball-Reference.com. Retrieved March 10, 2017. ^ "2005 Awards Voting". Baseball-Reference.com. Retrieved August 10, 2006. ^ "Chevrolet Presents the Major League Baseball Latino Legends Team Unveiled Today; Twelve Players Selected by Fans Honored Prior to Game Four of the 2005 World Series" (Press release). Major League Baseball. Business Wire. October 26, 2005. Retrieved February 18, 2018. ^ "Mariano Rivera Splits – 2006". ESPN.com. Retrieved April 6, 2018. ^ "Cabrera robs Ramirez of tying homer in Yankees' win". ESPN.com. Associated Press. June 6, 2006. Retrieved May 14, 2017. ^ Feinsand, Mark (July 10, 2006). "Guillen tabs Rivera as AL stopper". MLB.com. Archived from the original on November 12, 2014. Retrieved November 12, 2014. ^ "Young's two-run triple in ninth lifts AL All-Stars". ESPN.com. Associated Press. July 11, 2006. Retrieved May 14, 2017. ^ Mink, Ryan (July 16, 2006). "Rivera notches save No. 400". MLB.com. Archived from the original on November 12, 2014. Retrieved November 12, 2014. ^ "Yankees' Rivera to rest one more day, throw Friday". ESPN.com. Associated Press. September 8, 2006. Retrieved May 14, 2017. ^ Feinsand, Mark (October 24, 2006). "Rivera is DHL Delivery Man of the Year". MLB.com. Archived from the original on November 12, 2014. Retrieved November 12, 2014. ^ "Rivera says he'll consider offers from other teams". ESPN.com. Associated Press. February 14, 2007. Retrieved May 14, 2017. ^ a b "Mariano Rivera Splits – 2007". ESPN.com. Retrieved May 14, 2017. ^ a b White, Paul (May 30, 2007). "Confidence game as closer has few winners". USA Today. Retrieved February 26, 2013. ^ "Abreu's HR, 5 RBIs steer Wang, Yankees by Rays". ESPN.com. Associated Press. July 14, 2007. Retrieved May 14, 2017. ^ "Rivera: Torre's return a factor in whether he stays in N.Y." ESPN.com. Associated Press. October 10, 2007. Retrieved May 14, 2017. ^ Hoch, Bryan (October 18, 2007). "Torre declines Yankees' contract offer". MLB.com. Archived from the original on November 12, 2014. Retrieved November 12, 2014. ^ "Rivera becomes highest paid closer with Yankees' deal". ESPN.com. News services. November 20, 2007. Retrieved May 14, 2017. ^ "A-Rod, Nady blast off in 12th, lift Yanks over Twins". USA Today. Associated Press. August 13, 2008. Retrieved June 19, 2014. ^ "Mariano Rivera Splits – 2008". ESPN.com. Retrieved May 14, 2017. ^ Klapisch, Bob (July 8, 2008). "Starting Rivera in Midsummer Classic would be ultimate tribute". ESPN.com. Retrieved May 14, 2017. ^ Benjamin, Amalie (July 11, 2008). "For starters, Rivera?". Boston.com. Retrieved May 4, 2016. ^ "New York begins probable final week at Yankee Stadium with win over ChiSox". ESPN.com. Associated Press. September 15, 2008. Retrieved May 14, 2017. ^ "For final game at Yankee Stadium, Yanks win to prevent playoff elimination". ESPN.com. Associated Press. September 21, 2008. Retrieved May 14, 2017. ^ "Yanks' Rivera to undergo offseason surgery, should be ready for spring". ESPN.com. Associated Press. September 29, 2008. Retrieved May 14, 2017. ^ Kepner, Tyler (February 15, 2009). "Rivera Takes His Time Recovering From Surgery". The New York Times (New York ed.). p. SP3. Retrieved June 19, 2014. ^ "2008 Awards Voting". Baseball-Reference.com. Retrieved March 10, 2017. ^ "Mariano Rivera Pitching Gamelogs for Career Games 852 to 863". Baseball-Reference.com. Retrieved March 10, 2017. ^ DiComo, Anthony (May 8, 2009). "Limited Rivera allows historic homers". MLB.com. Archived from the original on November 12, 2014. Retrieved November 12, 2014. ^ "Rivera's 500th save punctuates Yankees' Subway Series sweep of Mets". ESPN.com. Associated Press. June 28, 2009. Retrieved May 14, 2017. ^ "Mariano Rivera Splits – 2009". ESPN.com. Retrieved May 14, 2017. ^ a b "Crawford's glove runs AL's unbeaten streak to 13 All-Star Games". ESPN.com. Associated Press. July 14, 2009. Retrieved May 14, 2017. ^ "Mariano Rivera Stats – 2009 Game Log". ESPN.com. Retrieved May 14, 2017. ^ Hoch, Bryan (September 19, 2009). "Mariano records 1,000th strikeout". MLB.com. Archived from the original on November 12, 2014. Retrieved November 12, 2014. ^ Curry, Jack (November 6, 2009). "Rivera, Nearing 40, Wants to Play Five More Seasons". The New York Times (New York ed.). p. B14. Retrieved November 5, 2009. ^ a b DiComo, Anthony (October 14, 2009). "Mariano wins Delivery Man of Year Award". MLB.com. Archived from the original on November 12, 2014. Retrieved November 12, 2014. ^ a b Bradley, Ken (December 17, 2009). "2009 Sporting News Pro Athlete of the Year: Mariano Rivera, Yankees closer". Sporting News. Archived from the original on March 5, 2016. Retrieved January 10, 2016. ^ Crasnick, Jerry (December 16, 2009). "Most valuable pitcher of the 2000s". ESPN.com. Retrieved May 14, 2017. ^ "Scutaro's miscue leads to key run in Yankees' win over Red Sox". ESPN.com. Associated Press. April 6, 2010. Retrieved May 14, 2017. ^ a b "Mariano Rivera Splits – 2010". ESPN.com. Retrieved May 14, 2017. ^ Shpigel, Ben (June 24, 2010). "Yankees Win, but It Isn't Pretty". The New York Times. Retrieved June 25, 2010. ^ Marchand, Andrew (July 6, 2010). "Rivera 'pitching hurt,' no All-Star Game". ESPN.com. Retrieved May 14, 2017. "Rivera close to $30M deal". Atlanta Journal-Constitution. News services. December 4, 2010. p. C2. "Yanks, Rivera Finalize Deal". Daily Record. Associated Press. December 15, 2010. p. B2. ^ Castrovince, Anthony (March 13, 2011). "Mo right on cue in Grapefruit League debut". MLB.com. Archived from the original on November 12, 2014. Retrieved November 12, 2014. ^ "Progressive Leaders & Records for Games Finished". Baseball-Reference.com. Retrieved September 14, 2011. ^ a b Begley, Ian (May 25, 2011). "Mariano Rivera in 1,000th game". ESPN.com. Retrieved May 14, 2017. ^ "Mariano Rivera Splits – 2011". ESPN.com. Retrieved May 14, 2017. ^ Borden, Sam (July 8, 2011). "Rivera Withdraws From All-Star Game". The New York Times (New York ed.). p. B13. Retrieved July 11, 2011. ^ a b Waldstein, David (September 14, 2011). "Rivera Notches Save No. 600 in Seattle as Yankees Win". The New York Times. Retrieved September 26, 2011. ^ "Yanks' Mariano Rivera ties MLB record with 601st save". ESPN.com. Associated Press. September 17, 2011. Retrieved May 14, 2017. ^ Begley, Ian (September 19, 2011). "Mariano Rivera sets new saves record". ESPN.com. Retrieved May 14, 2017. ^ Fitzpatrick, Mike (September 20, 2011). "Rivera congratulated by President of Panama". USA Today. Retrieved August 21, 2014. ^ a b "Mariano Rivera of the New York Yankees named the American League Player of the Week" (Press release). Major League Baseball. September 26, 2011. Archived from the original on March 4, 2016. Retrieved September 26, 2011. ^ Marchand, Andrew (December 1, 2011). "Mariano Rivera to have throat surgery". ESPN.com. Retrieved May 14, 2017. ^ a b Feinsand, Mark (May 4, 2012). "Mariano Rivera suffers torn ACL in right knee shagging flies, will miss rest of 2012 season". New York Daily News. Retrieved June 11, 2013. ^ a b Didtler, Mark (March 9, 2013). "Yankees Closer Rivera Says This Is Final Season". Associated Press. Retrieved May 4, 2016. ^ a b Verducci, Tom (May 4, 2012). "Rivera's storied career may be over after suffering torn ACL in BP". SI.com. Retrieved August 21, 2014. ^ Hoch, Bryan (February 20, 2012). "Rivera strongly implies this will be final season". MLB.com. Archived from the original on November 12, 2014. Retrieved November 12, 2014. ^ Matthews, Wallace (May 4, 2012). "Mariano Rivera says he'll be back". ESPN.com. Retrieved April 6, 2018. ^ Bloom, Barry M. (June 12, 2012). "Mo pleased after undergoing surgery". MLB.com. Retrieved April 6, 2018. ^ Bradley, Jeff (November 3, 2012). "Mariano Rivera tells Yankees he will return for 2013 season". NJ.com. Retrieved November 27, 2012. ^ Arangure, Jorge Jr. (December 1, 2012). "Rivera Deal Is Finalized; Now Catcher Is Priority". The New York Times (New York ed.). p. D4. Retrieved February 26, 2013. ^ Barbarisi, Daniel (April 10, 2013). "No, Really: Tell Me About You". The Wall Street Journal. Archived from the original on February 3, 2015. Retrieved December 26, 2018. (Subscription required (help)). ^ Souhan, Jim (July 2, 2013). "Rivera, one of baseball's greats, shows common touch". StarTribune.com. Retrieved August 15, 2015. ^ Sargent, Scott (May 13, 2013). "Mo gets the gold". ESPN.com. Retrieved April 6, 2018. ^ Erickson, Kelly (July 2, 2013). "Twins present Rivera with specially crafted chair". MLB.com. Retrieved April 6, 2018. ^ a b National Post Staff (September 19, 2013). "Yankees closer Mariano Rivera has picked up plenty of treasures along his farewell tour". National Post. Retrieved April 6, 2018. ^ Musarra, Casey (July 12, 2013). "Mariano Rivera throws 'last pitch' to Joe Girardi at Delta plane dedication". Newsday. Retrieved September 30, 2013. ^ Rovell, Darren (September 26, 2013). "Hard Rock boots Metallica for Mo". ESPN.com. Retrieved May 14, 2017. ^ Marchand, Andrew (April 30, 2013). "Postgame Notes: No April Fools". ESPN.com. Retrieved May 14, 2017. ^ Knobler, Danny (May 28, 2013). "In his last regular-season game at Citi Field, a first for Mariano Rivera". CBSSports.com. Archived from the original on May 30, 2013. Retrieved May 28, 2013. ^ "Mariano Rivera 2013 Pitching Splits". Baseball-Reference.com. Retrieved March 10, 2017. ^ Simon, Mark (July 16, 2013). "W2W4: Yankees in the All-Star Game". ESPN.com. Retrieved April 6, 2018. ^ a b Berry, Adam (September 29, 2013). "Final ASG appearance fit for Mo's legend". MLB.com. Retrieved April 6, 2018. ^ a b c ESPN Stats & Information (July 17, 2013). "Pitching riches overwhelm in All-Star Game". ESPN.com. Retrieved May 14, 2017. ^ Spaulding, Jeff (October 20, 2013). "Being: Mariano". Being. Fox. ^ Begley, Ian (September 22, 2013). "Yankees honor Mariano Rivera". ESPN.com. Retrieved May 14, 2017. ^ Waldstein, David (September 27, 2013). "Closing Scene: Hugs and Tears in Rivera's Last Home Game". The New York Times (New York ed.). p. B11. Retrieved September 27, 2013. ^ a b c d Casella, Paul (November 4, 2013). "Mo' haul: Man of Year, two Comeback honors". MLB.com. Retrieved April 6, 2018. ^ a b c "Mariano Rivera Receives Commissioner's Historic Achievement Award" (Press release). Major League Baseball. October 24, 2013. Archived from the original on October 31, 2017. Retrieved May 14, 2017. ^ a b c Harper, John (September 20, 2011). "Mariano Rivera says it was divine intervention, but for hitters, his cutter has been pure Hell". New York Daily News. Retrieved April 6, 2018. ^ a b c Olney, Buster (April 2, 2000). "Rivera Tops in Broken Bats and Broken Hearts". The New York Times. Retrieved October 18, 2013. ^ Klapisch, Bob (September 13, 2011). "Yankee great Mariano Rivera is in a class by himself". NorthJersey.com. Archived from the original on October 12, 2013. Retrieved September 17, 2011. ^ a b "Mariano Rivera » PitchFx » Overview". Fangraphs. Retrieved September 7, 2011. ^ a b Stark, Jayson. "The pitches that scare major leaguers". ESPN.com. Retrieved March 5, 2009. ^ Klapisch, Bob (June 26, 1996). "Rivera Uncorks the Heat". The Record. p. S1. ^ a b c d e Olney, Buster (February 28, 1999). "Rivera Now Delivers A More Subtle Sting". The New York Times. Retrieved October 18, 2013. ^ Verducci, Tom (October 25, 1999). "Out at Home". Sports Illustrated. Vol. 91 no. 16. pp. 42–47. Retrieved August 21, 2014. ^ Kuty, Brendan (January 23, 2019). "Why Yankees great Mariano Rivera isn't thrilled about state of baseball | 9 takeaways from Hall of Fame press conference". NJ.com. Retrieved February 2, 2019. ^ Carig, Marc (September 20, 2011). "One Man. One Pitch". The Star-Ledger. pp. 40–41. Retrieved February 28, 2014. ^ Sheppard, Drew (May 16, 2013). "Mariano Rivera Breaking Bats". Fangraphs. Retrieved March 1, 2014. ^ a b Verducci, Tom (September 23, 2013). "Exit Sandman". Sports Illustrated. Vol. 119 no. 12. pp. 36–43. Retrieved August 21, 2014. ^ "Career Leaders & Records for Strikeouts/Base on Balls". Baseball-Reference.com. Retrieved October 20, 2017. ^ Kepner, Tyler (March 23, 2004). "For Yankees and Rivera, It's Case Closed". The New York Times. Retrieved July 25, 2007. ^ Berardino, Mike (October 22, 1998). "Bochy Defends His Game 3 Decisions". South Florida Sun-Sentinel. p. C6. Retrieved March 27, 2012. ^ Olney, Buster (February 20, 2010). "Taking a Paige from Rivera's book". ESPN.com. Retrieved May 14, 2017. (Subscription required (help)). ^ Rodriguez, Alex (January 23, 2019). "A-Rod: PED usage shouldn't ban players from Hall of Fame". First Take (Television broadcast). ESPN. Retrieved January 23, 2019. ^ Kepner, Tyler (March 9, 2008). "Rivera's a Closer With an Open Heart". The New York Times. Retrieved September 8, 2011. ^ Canseco, Mario (October 1, 2013). "The Enduring Example of Mariano Rivera". Vancouversun.com. Retrieved May 4, 2016. ^ Waldstein, David (September 15, 2011). "Yanks' Closer Also Serves as Mentor and Counselor Hall of Fame closer". The New York Times (New York ed.). p. B12. Retrieved September 23, 2011. ^ Castrovince, Anthony (September 19, 2011). "Cutter above the rest: Mo takes rightful place". MLB.com. Archived from the original on November 12, 2014. Retrieved November 12, 2014. ^ Waldstein, David (September 11, 2011). "Quietly, Rivera Nears an Underrated Record". The New York Times (New York ed.). p. SP2. Retrieved September 19, 2011. ^ Gross, Brian; Lindeman, Todd (March 29, 2011). "There's Mariano... and everyone else". WashingtonPost.com. Retrieved April 5, 2011. ^ "Panama's Mariano Rivera, the best closer in baseball history, ends his 19-year career". The Tico Times. September 20, 2013. Retrieved August 3, 2016. ^ a b "Historical Player Stats". MLB.com. Retrieved August 22, 2011. ^ a b Boston Herald staff (June 9, 2013). "Big Savings". BostonHerald.com. Archived from the original on June 9, 2013. Retrieved June 9, 2013. ^ a b "Bartolo Colón halts skid as Mariano Rivera helps Yanks stop A's". ESPN.com. Associated Press. July 24, 2011. Retrieved May 14, 2017. ^ a b Ehalt, Matt (July 13, 2013). "Mariano Rivera hits 30 saves again". ESPN.com. Retrieved May 14, 2017. ^ a b "New York Yankees at Boston Red Sox". Sunday Night Baseball. August 18, 2013. ESPN. ^ a b c d Pouliot, Matthew (September 3, 2013). "Mariano Rivera notches ninth 40-save season". NBCSports.com. Retrieved January 10, 2016. ^ Plaschke, Bill (September 20, 2011). "Mariano Rivera is great, but let's not overdo it". Los Angeles Times. Retrieved September 20, 2011. ^ a b Verducci, Tom (November 21, 2011). "My Sportsman: Mariano Rivera". SI.com. Retrieved August 21, 2014. ^ a b "Career Leaders & Records for Adjusted ERA+". Baseball-Reference.com. Retrieved September 23, 2013. ^ ESPN Stats & Information (March 7, 2013). "Farewell by the numbers for Mariano Rivera". ESPN.com. Retrieved May 14, 2017. ^ a b Verducci, Tom (June 1, 2004). "Gotta get to Mo". SI.com. Retrieved August 21, 2014. ^ a b c Gonzalez, Alden (September 14, 2011). "Postmaster general: In playoffs, Rivera is tops". MLB.com. Archived from the original on November 12, 2014. Retrieved November 12, 2014. ^ Axisa, Mike (January 17, 2019). "2019 Baseball Hall of Fame: Putting Mariano Rivera's historic career with Yankees into context as he readies for induction". CBSSports.com. Retrieved January 17, 2019. ^ "MLB Hall of Fall (2009)". ESPN.com. Retrieved May 14, 2017. ^ DiComo, Anthony (June 29, 2009). "Friends, foes respect Rivera's dominance". MLB.com. Archived from the original on November 12, 2014. Retrieved November 12, 2014. ^ Verducci, Tom (September 13, 2011). "As he nears record, Rivera's career a study of poetry in motion". SI.com. Retrieved August 21, 2014. ^ Gardner, Steve (October 24, 2013). "Mariano Rivera gets World Series sendoff at Fenway". USA Today. Retrieved November 13, 2013. ^ Matthews, Wallace (September 19, 2011). "Save No. 602 cements Mo as No. 1". ESPN.com. Retrieved May 14, 2017. ^ Feinsand, Mark (June 29, 2009). "Goose Gossage closes debate, says Mariano Rivera's the all-time best". New York Daily News. Retrieved June 24, 2013. ^ "MLB: All-Time #MLBRank, Nos. 50-41". ESPN.com. July 20, 2016. Retrieved July 22, 2016. ^ Rodriguez, Justin (July 14, 2009). "All-Starry-eyed Nathan". Times Herald-Record. Retrieved May 19, 2010. ^ Feinsand, Mark (July 14, 2009). "Yankees Derek Jeter and Mariano Rivera praised at 10th All-Star trip". New York Daily News. Retrieved November 1, 2011. ^ O'Connor, Ian (March 6, 2013). "Jackie's widow: Mo worthy of No. 42". ESPN.com. Retrieved May 14, 2017. ^ Curry, Jack (July 17, 2006). "Guillén's Rare Retreat Is a Show of Respect for Rivera". The New York Times. Retrieved August 10, 2006. ^ Ortiz, David (September 23, 2015). "The Five Toughest Pitchers I've Ever Faced". The Players' Tribune. Retrieved April 6, 2018. ^ McAdam, Sean (April 20, 2004). "Knockout pitches". ESPN.com. Retrieved May 14, 2017. ^ Olney, Buster (September 29, 2006). "20 best postseason weapons". ESPN.com. Archived from the original on September 25, 2012. Retrieved August 14, 2012. (Subscription required (help)). ^ Kepner, Tyler (January 21, 2019). "How Rivera Helped Steer Halladay Toward the Hall". The New York Times (New York ed.). p. D6. Retrieved February 2, 2019. ^ Hoch, Bryan (January 22, 2019). "Mo is 1st in history with unanimous Hall election". MLB.com. Retrieved January 23, 2019. ^ Sawchik, Travis and Nathaniel Rakich (January 23, 2019). "Mariano Rivera's Unanimous Induction Shows An Evolving Cooperstown". FiveThirtyEight. Retrieved January 23, 2019. ^ Curry, Jack (March 10, 2005). "Fear Drives Rivera to Bring Family Here". The New York Times. Retrieved April 6, 2018. ^ Jennings, Chad (January 28, 2014). "Mariano Rivera finally getting some recognition". The LoHud Yankees Blog. Retrieved February 12, 2014. ^ Tucker, Douglas (June 8, 2014). "Yanks draft Mariano Rivera's son". ESPN.com. Retrieved May 14, 2017. ^ a b "Nats take Mariano Rivera Jr. in 4th round; other notable names off board". ESPN.com. News services. June 9, 2015. Retrieved May 14, 2017. ^ Bryant, Howard (June 12, 2009). "At 39, the great Rivera fighting mortality". ESPN.com. Retrieved May 14, 2017. ^ "150 Become Citizens During Two Ceremonies in New York". DHS.gov. October 26, 2015. Retrieved January 25, 2017. ^ "Mariano Rivera calls child support allegations 'unfounded'". ESPN.com. Associated Press. February 19, 2019. Retrieved February 20, 2019. ^ Olney, Buster (May 2, 2005). "Excerpt from the "Epilogue" for The Last Night of the Yankee Dynasty: The Game, the Team, and the Cost of Greatness". ESPN.com. Retrieved May 14, 2017. ^ "Mariano Rivera Foundation Hosting Event to Raise Money for Hurricane Maria Efforts". CBS Tampa Bay. January 16, 2018. Retrieved March 15, 2019. ^ "Legendary Pitcher Mariano Rivera Hits Home Run by Donating New Instruments and Uniforms to High School Band" (Press release). Giles Communications. PRWeb. November 20, 2014. Retrieved March 15, 2019. ^ "Major League Baseball players announce finalists for 2013 Players Choice Awards" (Press release). Major League Baseball Players Association. February 18, 2014. Retrieved February 18, 2014. ^ a b Miller, Lisa (June 17, 2013). "Saved". New York. Retrieved June 11, 2013. ^ Fitzgerald, Jim (March 6, 2014). "Baseball Star Rivera Rescues, Renovates NY Church". Associated Press. Retrieved August 21, 2014. ^ a b c d Cormier, Ryan (April 15, 2018). "Rivera picks charity base". The Record. p. 2S. Retrieved March 15, 2019. ^ Kramer, Peter D. (October 5, 2015). "The (new) fall of Mariano Rivera". Lohud.com. Retrieved April 6, 2018. ^ Reiner, Dan (September 23, 2016). "Mariano Rivera, wife present CNR scholarships". Lohud.com. Retrieved January 18, 2019. ^ Antunes, Anderson (January 11, 2012). "The 30 Most Generous Celebrities". Forbes. Retrieved January 19, 2012. ^ Wade, Christian (May 24, 2013). "Yankee Mariano Rivera's ultimate 'save': New Rochelle church". Newsday. Retrieved November 29, 2013. ^ "Yankees closer Rivera to open Saratoga eatery in NYC". Times Union. Associated Press. April 24, 2012. Retrieved May 3, 2012. ^ Marsh, Julia (November 27, 2013). "'Rivera ghetto' shocker: 'Mo folks' eatery sues". New York Post. p. 25. Retrieved November 29, 2013. ^ Stock, Justin (April 13, 2012). "Yankees Pitcher Mariano Rivera Puts Westchester Restaurant on DL". The Daily Voice. Retrieved January 10, 2016. ^ Mikulak, Robert (July 30, 2015). "Yankee Great Mariano Rivera Opens Car Dealership In Mount Kisco". The Daily Voice. Retrieved October 8, 2015. ^ Fish, Mike (July 6, 2007). "Advertisers are riding the Hispanic wave". ESPN.com. Retrieved May 14, 2017. ^ Araton, Harvey (April 26, 2010). "The Understated Elegance of the Yankees' Rivera". The New York Times (New York ed.). p. D1. Retrieved September 20, 2011. ^ "Mariano Rivera to Pitch for SKECHERS" (Press release). Business Wire. Berkshire Hathaway. September 9, 2014. Retrieved August 4, 2015. ^ Levinson, Mason (June 2, 2015). "Mariano Rivera to Promote Hartford Insurance in Deal With MLB". Bloomberg.com. Retrieved August 4, 2015. ^ "Pinstripe Power: Jeter, Rivera Top List of 10 Most Marketable Players in Baseball". Nielsen Company. March 24, 2011. Retrieved August 21, 2014. ^ Newman, Mark (April 5, 2012). "Jeter has top-selling MLB jersey again in 2011". MLB.com. Retrieved April 6, 2018. ^ Newman, Mark (September 26, 2013). "Rivera's No. 42 jersey is MLB's most popular". MLB.com. Retrieved April 6, 2018. ^ Gaines, Cork (September 27, 2013). "CHART: Mariano Rivera Made More Than $160 Million In His Career". Business Insider. Retrieved March 26, 2016. ^ Red, Christian (March 4, 2014). "Former Yankee closer Mariano Rivera honored by Jackie Robinson Foundation". New York Daily News. Retrieved December 9, 2014. ^ "Tom Brokaw, Mariano Rivera & Andrew Shue Receive a Jefferson Award for Public Service" (Press release). Jefferson Awards. PRWeb. March 3, 2014. Retrieved March 31, 2014. ^ Nowak, Joey (February 13, 2014). "Yanks, Marlins to play in Panama, with Mo on hand". MLB.com. Retrieved April 6, 2018. ^ Sanders, Jeff (April 9, 2014). "Relief awards named for Hoffman, Rivera". San Diego Union-Tribune. Retrieved May 14, 2017. ^ Davidson, Kavitha A. (May 6, 2014). "Mo's Road to the Hall Starts At Rivera Avenue". Bloomberg View. Retrieved May 14, 2017. ^ "Cano: Mo Rivera still 'the best closer". ESPN.com. News services. May 7, 2014. Retrieved May 14, 2017. ^ Feinsand, Mark (May 21, 2014). "Mariano Rivera receives honorary Doctorate from NYU at Yankee Stadium". New York Daily News. Retrieved June 17, 2014. ^ Beauge, John (August 25, 2015). "Mariano Rivera puts Little League Hall of Excellence up there with other honors". Pennlive.com. PA Media Group. Retrieved September 21, 2015. ^ Caldera, Pete (August 14, 2016). "Yankees great Mariano Rivera gets Monument Park plaque". NorthJersey.com. Retrieved April 6, 2018. ^ "Mariano Rivera, Bill Belichick among nominees for president's sports council". ESPN.com. May 4, 2018. Retrieved May 6, 2018. ^ Britton, Tim (July 7, 2010). "Mo wins Pepsi Clutch honor for June". MLB.com. Archived from the original on November 12, 2014. Retrieved November 12, 2014. ^ Hoch, Bryan (May 7, 2008). "Mariano is DHL's Delivery Man for April". MLB.com. Archived from the original on November 12, 2014. Retrieved November 12, 2014. Singer, Tom (August 6, 2009). "Rivera named Delivery Man for July". MLB.com. Archived from the original on November 12, 2014. Retrieved November 12, 2014. ^ McGuire, Justin (October 21, 2013). "Sporting News MLB awards: Mariano Rivera, Francisco Liriano voted top comebackers". Sporting News. Retrieved May 4, 2016. ^ "Fireman of the Year / Reliever of the Year Award by The Sporting News". Baseball Almanac. Retrieved June 19, 2009. ^ "2009 This Year in Baseball Awards". MLB.com. Retrieved December 17, 2009. ^ Haudricourt, Tom (January 17, 2003). "Yankees still looking to deal". The Record. p. S03. ^ "Career Leaders & Records for Games Finished". Baseball-Reference.com. Retrieved June 29, 2011. ^ Boland, Erik (November 4, 2013). "Mariano Rivera named AL Comeback Player of the Year by MLB.com". Newsday. Retrieved March 8, 2016. ^ Stark, Jayson (September 25, 2013). "Mariano Rivera: A 21-stat salute". ESPN.com. Retrieved May 14, 2017. ^ "Most seasons with 20+ saves, sub-2.00 ERA, sub-1.00 WHIP (min. 60 IP, 80% games in relief)". Baseball-Reference.com. Retrieved March 10, 2017. Reference not updated to include 2010 or 2011. ^ Botte, Peter (July 6, 2013). "Yankees bail out Andy Pettitte to beat Orioles, 5-4, for sixth straight win". New York Daily News. Retrieved July 6, 2013. ^ Nowak, Joey (June 7, 2013). "Catching up with now-daily Interleague Play". MLB.com. Retrieved April 6, 2018. Note: Reference not updated to include 2 saves against the Dodgers in June and July 2013, and 1 save against the Padres in August 2013. ^ Kernan, Kevin (September 22, 2008). "Rivera Closes Ol' Park in Style". New York Post. Retrieved June 19, 2014. ^ Casella, Paul (October 26, 2014). "Game 4 Did you know: Petit makes mark at bat, on mound". MLB.com. Retrieved April 6, 2018. ^ a b c "All-time and Single-Season LDS Pitching Leaders". Baseball-Reference.com. Retrieved October 11, 2009. ^ a b "All-time and Single-Season LCS Pitching Leaders". Baseball-Reference.com. Retrieved October 26, 2009. ^ a b "All-time and Single-Season World Series Pitching Leaders". Baseball-Reference.com. Retrieved October 11, 2009. ^ Sharp, Katie and Mark Simon (August 2, 2013). "One Mo Time: Rivera vs. Padres". ESPN.com. Retrieved May 14, 2017. ^ Singer, Tom (July 5, 2009). "Red Sox six-pack leads AL squad". MLB.com. Archived from the original on November 12, 2014. Retrieved November 12, 2014. ^ a b c d "New York Yankees Top 10 Career Pitching Leaders". Baseball-Reference.com. Retrieved April 13, 2018. ^ a b c "New York Yankees Top 10 Single-Season Pitching Leaders". Baseball-Reference.com. Retrieved April 13, 2018. ^ "Longest streak of consecutive saves converted in Yankee history". Baseball-Reference.com. Retrieved March 10, 2017. Hollander, Dave (2005). 52 Weeks: Interviews with Champions!. Guilford, Connecticut: The Lyons Press. ISBN 1-59921-008-8. Levin, Judith (2008). Mariano Rivera. New York: Checkmark Books. ISBN 978-0-7910-9599-7. "Mariano Rivera 42 | P: Player Bio Information". MLB.com. Retrieved August 21, 2013. Rosen, Charley (2011). Bullpen Diaries: Mariano Rivera, Bronx Dreams, Pinstripe Legends, and the Future of the New York Yankees. New York: HarperCollins. ISBN 978-0-06-200598-4. Sherman, Joel (2006). Birth of a Dynasty: Behind the Pinstripes with the 1996 Yankees (PDF). Emmaus, Pennsylvania: Rodale. ISBN 978-1-59486-244-1. Archived from the original (PDF) on July 15, 2011. Retrieved April 28, 2009. Tan, Cecilia (2005). The 50 Greatest Yankee Games. Hoboken: John Wiley & Sons. ISBN 978-0-471-65938-9. Zimniuch, Fran (2010). Fireman: The Evolution of the Closer in Baseball. Chicago: Triumph Books. ISBN 978-1-60078-312-8. 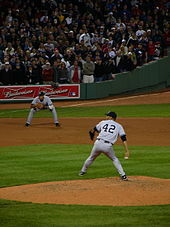 Wikimedia Commons has media related to Mariano Rivera.